What does ‘Play’ mean to us? Thank you for choosing to refer a new customer – we are delighted to offer you & your friend a full free day at our Holiday Play Scheme. Please fill out our Referral Form below to allow us to contact the new customer with their individual discount code. *The referee will only receive a discount code once the new customer makes their first Holiday Club Booking. 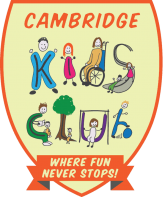 This referral discount will only be given for referring a new customer – someone who has never used Cambridge Kids Club before. Discount can only be used for a single full day session, on non-special activities and trips days. Any additional charges for special activities and trips will need to be paid at time of booking. Our standard Cancellation Policy applies. You can not use more than one discount code per booking. Discounts can not be applied to a booking already in place.